Accent your Turkey Day soiree with these clever little four inch sculptures by Jacques Torres. 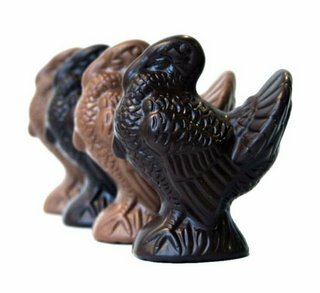 Molded out of both milk and dark chocolate, the hollow birds are great for nibbling or melting down for chocolate cake when all is said and done. Exactly! But much better quality. We had those last year. Hard to eat just the one we're given- at one point folks were lunging over the table to grab other folks' turkeys! When chocolate is involved, all bets are very much off.